Once again the June Lake Fire Department serves its famous smoked beef barbecue with all the fixin's on the second saturday of August. The firemen's bbq is June Lake's long-standing local summer event and reunion since the early 1950's. As always, many prizes are awarded to raffle ticket buyers throughout the day, and the Grand Prize winner will receive a fishing boat with motor and trailer. The High Sierra Triathlon Club has once again produced the June Lake Triathlon event. Results of both the olympic and sprint events are available at buzz productions race results section. See the High Sierra Triathlon Club's website for full details. The community of June Lake and the June Mountain Ski Area participate with a variety of sponsors to bring you some of the best in Winter Activities and Competitive endeavors at one of the most beautiful venues in the world. 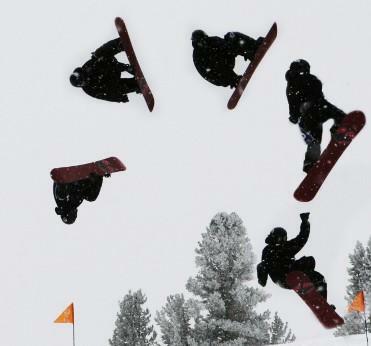 A number of special skiing and snowboarding events are scheduled in June Lake this winter. Whether you plan to be a spectator or a participant, you should mark your calendar and plan to be in attendance to share the excitement! Click here if you have you seen our billboard? See it on Hwy 395 northbound in Olancha (just past the Crystal Geyser plant). Read more about SEEN OUR BILLBOARD?? The OH! Card is a hard plastic 3-fold card that offers winter mid-week savings throughout June Lake. One side has small peel and stick coupons for redemption. Most every business in the June Lake Loop is offering midweek savings such as up to 25% lodging, up to 30% off dining. Retail stores offer considerable savings as well. There’s even savings for gasoline, guided back country skiing, a snowmobile package, spa day passes and massages. 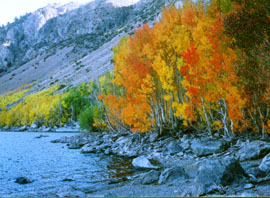 Autumn is one of the most pleasant times of the year in the Eastern Sierra. The air is clear, mornings are crisp and cool, and the groves of deciduous trees, primarily Aspen, take on spectacular hues of gold and red. Fishing conditions are generally improved as the water temperatures lower, and photographers are thrilled by the spectacular and colorful views. If you want to enjoy an uncrowded getaway for your fall vacation, June Lake is the perfect spot. June Lake once again offered "June Bucks" in conjunction with Troutstock Eastern Sierra, held on Labor Day weekend in 2007.